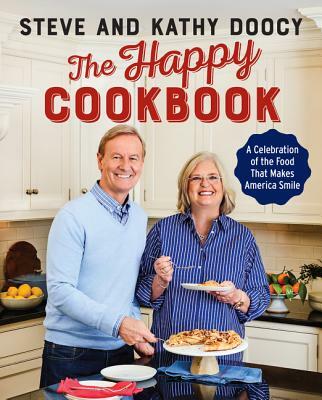 Steve Doocy calls Kathy, his wife of more than thirty years, "the best cook I’ve ever met." Together, they take joy in cooking and entertaining with their family and friends. In The Happy Cookbook, the Doocys share favorite recipes, stories, and photos from their family life. In addition to beloved family dishes, this full-color cookbook includes recipes from friends like musician Kid Rock, professional golfer Greg Norman, and many more! Offering an inside look at the Doocys’ home life—their food, stories, and infectious family spirit—The Happy Cookbook is all-American home cooking at its best: nothing fancy, and everything delicious! Steve Doocy is an Emmy Award-winning television personality and journalist. The longtime morning host of Fox & Friends, he previously worked as a host and news anchor for NBC and CBS and in local television. He is the author of the New York Times bestsellers The Mr. & Mrs. Happy Handbook (with his wife, Kathy) and Tales from the Dad Side. A one-time contestant on Food Network's Ready, Set, Cook!, Doocy was a wunderkind in the kitchen-- at age nine he won a blue ribbon at the Kansas State Fair for baking chocolate chip cookies (he used the recipe on the bag). Kathy Doocy co-authored The Mr. and Mrs. Happy Handbook and was previously the host of ESPN's Sidelines and worked at NBC. She started her career as a Ford model and actress starring in many commercialsshe threw the rental car keys to OJ and lip-synched "You Deserve a Break Today" for McDonald's. When Kathy and Steve got married and the kids came along, she became a stay-at-home mom and the family CEO. The Doocys have three grown children and more than twenty-five recipes for pot roast. They live in New Jersey.